Tom’s photo of the center of gravity of a rock festival, the stage ringed in lights at night. In 2009, the Isle of Wight Festival was headlined by Neil Young, whom some present at the time complained was too old. We beg to differ! This festival’s organizers provided a field for attendees to pitch their tents. This is where Tom and Maureen slept. This odd conjunction prompted me to action. Perhaps it wasn’t so odd, in retrospect, but I found it really striking that Neil and the Isle of Wight were coming together 39 years on. I have been a Neil Young fan since 1970, and a serious enough fan to find my way to see him for the first time at Carleton University in Ottawa, in about 1971. He was on the North American tour which turned into the “Harvest” album. I think that he had found out what he was going to play next on that tour, and then made an album of it. It was beautiful. I actually remember Ben Keith’s haunting pedal steel guitar at the concert, and the moment at the end when the fluorescent lights came on over band and audience alike. Everyone applauded everyone else. 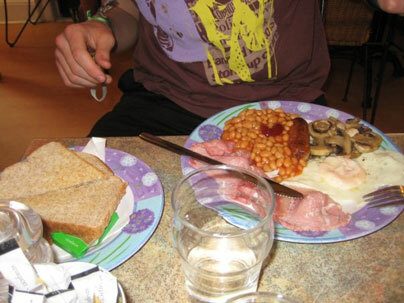 They found an English country breakfast which was good enoughto photograph: gammon, egg, mushrooms, beans, bacon . . . . Who says that the English can’t cook? I’d also attended the Isle of Wight festival in 1970, when Jimi Hendrix and the Doors both played, and the Who played Tommy from beginning to end, and continued playing almost the whole night, and I stayed awake for most of it! I couldn’t afford a ticket then, and watched at first from the hillside overlooking the enclosure while French anarchists started tearing its fence down. That interpretation of peace, love and music upset me, but I was grateful when the promoters made the festival free for all of us on the second or third day. Into the enclosure we all streamed. Maureen and Tom striking a pose at the festival. In other photos, he’s wearing his Pete Doherty t-shirt. That festival was three days and nights of the best music that the 1960s had to offer, rock and roll heros by the score, and a crowd of hundreds of thousands of scruffy kids like me, an audience of grunge before the word existed. Neil Young was going to play the Isle of Wight, and Tom was a musician living in Paris! He had been working very hard at his music, at college as well as in bars and pubs during the evening. He had even begun sending me recordings of his own songs, and they were great, really, from day one. He’s just got it. It didn’t take me long to figure out what I needed to do here. Some things are just meant to happen, and resistance is futile! I bought tickets to the festival for him and Maureen, his girlfriend, Eurostar tickets to get them to London, and catamaran tickets from Portsmouth to the Isle of Wight. It had been eighteen months since I’d done anything special for Tom, since he’d left our home in Santa Cruz. It was time. The stage in daylight, showing the giant screens that displayed the musicians to the bulk of the audience. They spent the nights in their tent in the tent village, and spent their days watching the acts and exploring the English countryside. And as a thank you, he sent me a bunch of pictures! Things had clearly changed a lot over the years. 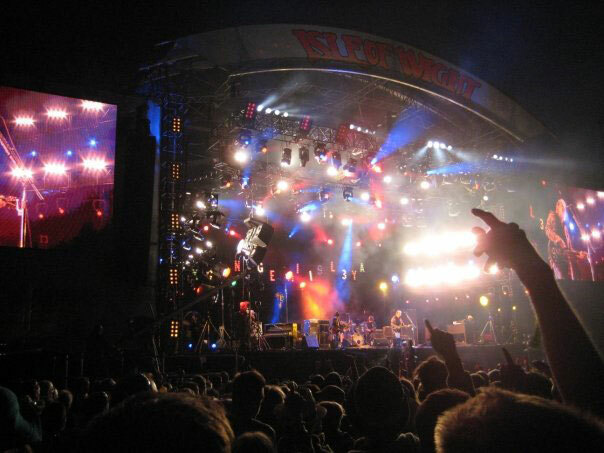 This 2009 Isle of Wight festival was organized, almost corporate in its structure, the antithesis of 1970. Attendance was about 50,000, with plenty of amenities and food, and sleeping and local travel well organized. Attendance in 1970 has been estimated at between 5 and 600,000. Really! Public transport had been overwhelmed, and traffic around the festival site could barely move. Tom in Paris playing with friends, including Leo. And finally, they left the festival before the end of Neil Young’s set! How could they!! I shouldn’t say that. He played the Sunday night, and they needed to be back in Paris for the Monday morning. The combination of catamaran off the island, train back to London from Portsmouth, tube across London to St Pancras station, and Eurostar back to Paris, took a while. I checked the set list, and by leaving early they missed at least “Down by the River,” an encore which ran for 15 minutes. Now that would have been something to see! I should have been there. Neil Young, projected onto one of the giant screens next to the stage.